We grow most of our plants right here on the farm from seed or cuttings, and graft all our trees onto vigorous rootstock we grow ourselves or purchase from the nursery trade. We try to buy from small family run organizations like ourselves whenever we can. Most of our plants are shipped bare root when they are dormant. We ship these plants in the spring and fall only, usually April/May and October/November. We prefer to grow our plants in real soil in nursery beds that we can mulch and improve with compost year after year, just like our vegetable garden. This method has many advantages, the single largest being your plant will be accustomed to real soil and real world conditions. Most plants produced commercially are pumped full of chemical fertilizers and pushed to grow FAST. These plants will often go backward when you plant them in your garden or orchard. They need a long time to adjust to real world conditions. Our plants are not like this. Transplant shock might slow them down for a little while, but then they will grow. If you need help with planting bare root, see the detailed instructions for handling and planting bare root plants here. We do propagate some plants in containers. 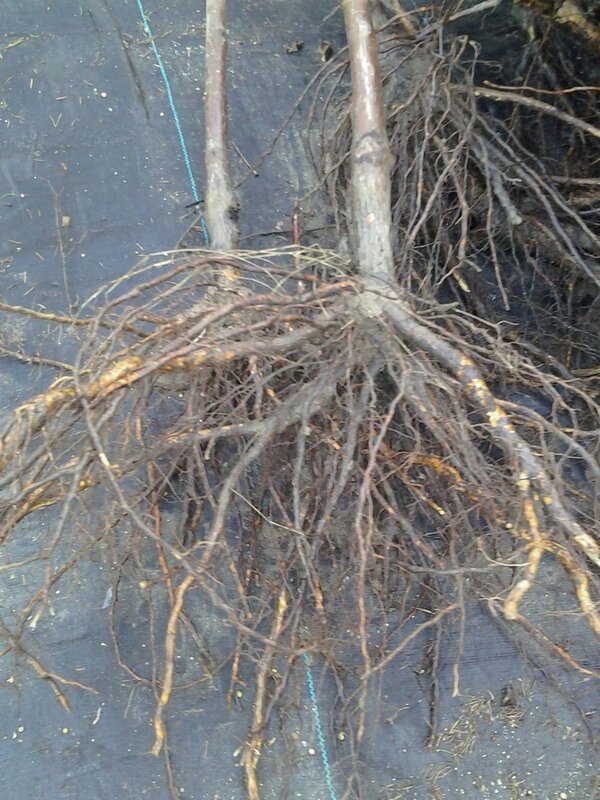 We usually remove the plants from the containers and ship them bare root. This save quite a bit of money on shipping, and we get to reuse the containers which helps keep our costs and use of plastics down. If you really need a plant to be shipped in a container, send an email and we will try to accommodate you. Save the bugs, feed the worms get your plants off drugs! We are a small family run operation. We love growing high quality plants, and sending them out into the world. We strive to give you a good value with everything you buy. We want you buying your plants from us for years to come. If you are ever unhappy with what you recieve from us, please do not hesitate to email us with your concerns. Our normal offerings are two sizes, smaller and larger. This most often correlates with age, but not always, some plant varieties are just really vigorous! Pricing reflects sizing. Grafted Fruit Tree varieties will usually make a small tree at about 2-4' tall , and a large will be 3-6' tall . Grafted Nut Trees will be of various height, as we may choose to graft anywhere from 6" to 2' from the ground, depending on tree species and size of the rootstock. One year Seedling trees will usually be 1-2' tall. Two and Three year Seedling trees will usually be 2-5'. Some trees, like Hickories, are very slow to get tall. A two-three year hickory might be 12-18" tall. We follow organic practices here on our farm, we mulch our plants with local wood chip mulch, and use compost produced on our farm chicken operation and organic fertilizers only. We hand weed and never use herbicides, pesticides, fungicides or any other chemical inputs. Most plants are not grown this way! Common horticultural production uses chemical soup to control weeds, kill insects and fertilize the plants. While we understand the cost benefit of these chemicals, we are constrained by our beliefs in the organic methods. So we do the opposite, we want and encourage huge populations and diversity in insects populations, which in turn feed the birds. We want healthy "weeds" to flower and feed our pollinators. We are hopeful in our small farm way to illustrate that nurseries can survive and thrive using higher cost methods that support a healthy world. Save the bugs, feed the worms get your land off drugs!